Pains on Trains is the perfect way to take the tedium out of commuting, guaranteed to become as indispensable to the seasoned traveller as the blow-up pillow and water sterilising tablets. 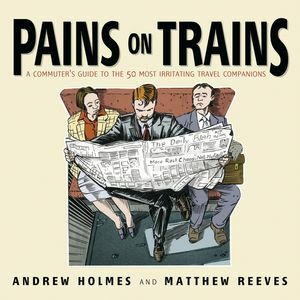 In Pains on Trains, Andrew Holmes and Matthew Reeves set their sights on the scourge of the modern office worker - other office workers who clog up trains, buses, boats and planes with their annoying habits and depressing clothes. Pains on Trains is dedicated to the rush-hour veteran and consists of a 'pain-spotting' guide to the very worst people you meet on your daily commute. Each painful character is illustrated in their usual context and supported by a short narrative. Andrew Holmes is a writer, serial commuter, gadfly and collector of stories and observations about the people around him. He spends far too much time on trains for his own good and is seeking professional help to overcome the obsessive-compulsive disorders that have resulted. He likes to spend as much time as possible with his family - assuming he ever gets home of course. Matt Reeves lives and works somewhat beyond the M25. Rumours that he is the model for 'The Creative' as featured in this book are grossly over-exaggerated. Working on this project has given Matt a more detailed understanding of the UK rail system and its commuters than he would have ideally liked. All proceeds derived by Matt from this book will be put towards his helicopter fund. The Born in a Stable.